We like the number 7 as a rule! 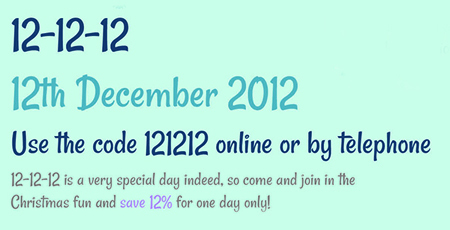 But we do think that the date 12-12-12 is really quite special - so a special Christmas discount seemed in order! So for one day only, on Wednesday 12th December, use the code 121212 online or by telephone, and you will save 12% on absolutely everything! We hope you enjoy this very special shopping day at Seventh Wave, and the Winter Wonderland Website including homepage snowflakes for Christmas! Gifts are not really our thing, but there is the wonderful Raw Gaia skincare, and the equipment section might be worth looking at for Christmas presents. But on the health side, the very healthy Celtic Salt makes a fabulous Christmas present, it's something all our staff like to give anyway, and it's a good way to introduce people to the world of natural nutrition. But presents aside it's a good day to save some money on your regular supplements for yourself!